As a food crisis spreads and malnutrition levels continue to rise, MSF is expanding the number of emergency malnutrition treatment programs it is operating in the country. 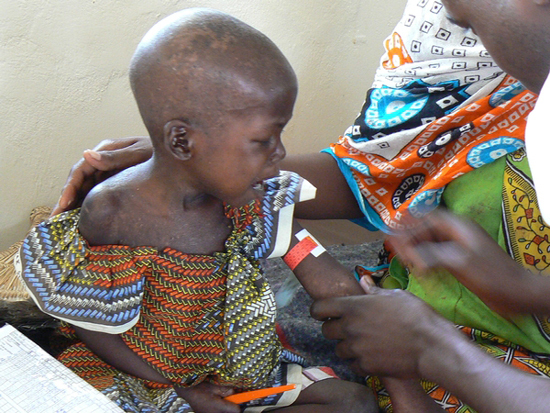 A staff member uses a MUAC to check a child for malnutrition at an MSF hospital in Chad. As a food crisis continues to spread and levels of severe acute malnutrition continue to rise in Chad, Doctors Without Borders/Médecins Sans Frontières (MSF) is expanding the number of emergency malnutrition treatment programs it is operating in the country. Even in a normal year, Chad has one of the highest rates of chronic malnutrition in the world. This year is showing signs of being worse than usual. In early 2012, in some areas of the country, rates of global acute malnutrition as high as 24 percent have already been reported among children under the age of five. Several factors including erratic rainfall, failed harvests, soaring food and fuel prices, early depletion of food stocks, and poor access to health care have contributed to the heightened malnutrition rates. In addition, tens of thousands of Chadians working in Libya fled the violence there and returned home, losing a crucial source of income. In April, MSF opened an inpatient therapeutic feeding center (ITFC) in the town of Biltine and five outpatient therapeutic feeding centers in outlying areas. To date, 282 children have been admitted to the outpatient centers and 42 critically ill and malnourished children have been treated on an inpatient basis. As challenging as current conditions are, the peak of malnutrition season usually doesn’t arrive until July. MSF therefore plans to open seven more outpatient therapeutic feeding centers in Biltine before mid-Summer. Here, Marcus Bachmann, MSF’s project coordinator in Biltine, discusses the situation. Why are there such alarming rates of malnutrition in Biltine? February is the beginning of the hunger gap in Chad, when families traditionally begin to run out of their food stocks. This year MSF found high rates of severe acute malnutrition rates among children under five, because only 46 percent of the harvest required to feed the population was harvested, which is well below the average. Many Chadians who worked in Libya also lost their jobs and returned home. Those men have moved to other parts of Chad to find work, but the salaries are much lower, so they are sending home less money. When the “lean season” began earlier in the year, women told us they would walk 15 to 25 kilometers [9 to 15 miles] to a health center and did not receive meaningful health attention for their malnourished children. Many health centers in this district are poorly equipped with poorly qualified staff. As a result, we are now making a huge effort to reach those mothers again and reassure them there is medical treatment for their child, that they will see a doctor or a nurse, and that they will get help. We need to regain the trust of the mothers in this area, and it is a huge job. 16-month-old Mahamat Sahel Souleyman is suffering from severe malnutrition for the second time in six months. His parents have brought him to the hospital in Biltine, where an MSF doctor has just weighed him and diagnosed him as underweight. He is also suffering from swollen feet, legs, and cheeks, a condition linked to malnutrition. He also has malaria, diarrhea, and a cough. Mahamat weighs only 5.5 kilograms, well below what a boy his age should weigh. His mother, Nousra, says her son fell ill with malnutrition just six months ago. “I took him to a hospital in another town and he was given milk and enriched peanut paste and made a full recovery.” But now, he is back on a consulting table, in Biltine hospital, being stabilized with oxygen and treated with antibiotics for his cough. Mahamat is one of three children. His family lives in Biltine and is more financially secure than most, as his father has a job with the local government. But his relatives are nomads who are now staying with the family, as they, like so many others, are in need of food and water because of the failed harvest. Nousra says that means less food for everyone. Mahamat will stay in hospital for a month where he’ll be fed therapeutic milk and ready-to-use therapeutic food. Then he’ll probably be released and receive weekly check-ups at an ambulatory treatment feeding center in an effort to prevent him from making another trip to hospital any time soon. How does an outpatient feeding center work? Our mobile team, made up of one MSF supervisor and nine medical workers, drives out to a local health clinic and sets up their equipment. They spend the day registering children and screening them for malnutrition by weighing them and measuring their arms [taking a mid-upper arm circumference, or MUAC, reading]. The children also undergo an appetite test and a malaria test. They receive a week’s work of therapeutic food and a blanket and malaria net. The mothers are expected to return on a weekly basis until their child is healthy again. Children who are very sick are referred to our pediatric ward at the hospital in Biltine town, where we have an intensive care unit to treat severe conditions. These are usually children who, due to the immunodeficiency caused by malnutrition, suffer from additional illnesses such as respiratory tract infections, diarrhea, or even tuberculosis. There can also be kids who are too weak to eat and have to be fed through a gastric tube. Ten-month-old Kadidya Oumer got sick when she was only six days old, and has been struggling to stay healthy ever since. Her grandmother, Halama, brought her to an ambulatory treatment feeding center in eastern Chad, saying the child had ongoing stomach problems, no appetite, and was very weak. Kadidya is an only child, but her mother is pregnant again, and has not been breast-feeding her. Her family has been suffering from the drought that has plagued their region for the past few months; the crops they harvested last season have run out and there is little drinking water due to the lack of rain. Halama says the family is barely surviving on millet and animal milk, and they are too poor to buy food at the market. When Kadidya arrived at the feeding center last week she weighed 6.5 kilograms [about 14 pounds], a half a kilogram less than normal for a child her age. An MSF nurse did a health assessment, treated her with an antibiotic, and checked her for malaria. She was diagnosed as severely malnourished and given a week’s supply of enriched peanut paste and a bed net to protect her from malaria. Kadidya’s grandmother has a weekly appointment at the feeding center in Dougine, so MSF nurses can monitor the girl’s condition and continue to supply her with the ready-to-use supplementary food. At her last visit Kadidya has lost more weight and her battle to get healthy is not over yet. The feeding center will remain open until next autumn and MSF will continue to care for Kadidya and provide her with every opportunity to survive and, hopefully, thrive. There are several things that touch me when I see the mothers coming to the feeding centers with their children. They have walked a long distance with a child on their back, in the harshest of conditions and in the hottest temperatures. They tell me they were doubtful that MSF would come back to help them week after week, and they are so delighted their children are finally getting treatment and getting better. We are gaining the trust of the mothers and they are spreading the word about us to other mothers. What are our plans and, what is MSF calling for? Our emergency intervention in Biltine will run until mid-December. We hope another organization, such as the World Food Program, will begin general food distribution to the population of Biltine as soon as possible. At MSF’s long-term project in Am Timan, located in Salamat region, in the southeast of the country, malnutrition rates are also escalating at an alarming rate. Between January and April, 2,478 children were admitted to ambulatory therapeutic feeding centers—almost twice as many as at the same time last year. In Yao, in Batha Region, MSF opened a nutrition program in April. Thus far, 420 children have been admitted. MSF runs a 200-bed pediatric hospital in the town of Massakory in western Chad's Hadjer Lamis region. Currently, 160 children are hospitalized, and cases are both pediatric and nutrition-related. This week, MSF opened a nutrition intervention in Abou Deia, where we expect to treat 1,000 children.